When you need help after fire and water damage has struck – you can count on BELFOR. It can happen suddenly and without warning……a fuse blows, a pipe bursts, a river overflows its banks and you are placed in an emergency situation. When this happens the greatest desire for all concerned is to get back to normal as quickly as possible. We understand this and we are here to help. BELFOR is one of the leading restoration companies in the UK and our core focus is recovering homes and businesses following fire and water damage. Not all restorers are the same and at BELFOR we do things differently. Knowledge, expertise and resources are key but it's our people and their passion that really make the difference. Many thousands of customers every year know this, making BELFOR their first choice. When you choose BELFOR you will be in safe hands. BELFOR are proud to announce its sponsorship of the Chartered Institute of Loss Adjusters Construction, Energy & Engineering Special Interest Group (SIG). BELFOR picked up its second major award for the year at the bi annual BDMA Awards ceremony 26th November 2015. 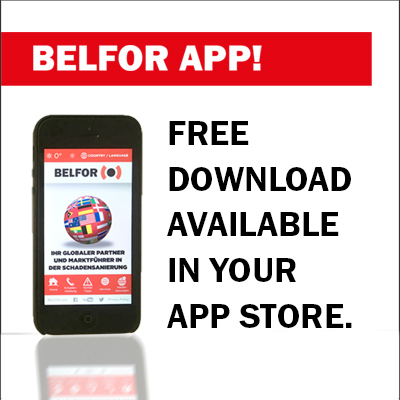 DOWNLOAD THE NEW BELFOR APP! The newest addition to the BELFOR fleet are the new Vauxhall Maxi-Low Luton vans. Continuing with its commitment to be the UK’s leading Specialist Restoration provider, BELFOR UK has invested further in its Technical Support Team. BELFOR UK shortlisted for BCI European Awards! As part of its overall recruitment programme BELFOR UK launches its new Junior Technician Trainee Programme in the UK.